Chronic kidney disease (CKD) is a major global health issue that progresses to end-stage renal disease (ESRD) if untreated. Current therapies for ESRD include dialysis and/or transplantation; these modalities are associated with high morbidity. Also, there is a shortage of organ donors. Therefore, preventing progression of CKD and developing alternative ESRD therapies are high priorities. , Cell therapy represents one such treatment. Stem cell-based kidney regeneration could help in reducing the incidence and severity of kidney disease. , Prodromidi et al showed in a mouse model of Alport's Syndrome that transplantation of whole bone marrow may act as a source of extra-renal cells that may replace defective podocytes. This approach ameliorated glomerular disease, at least in part, by restoring glomerular-3 expression. Li et al reported that infusion of bone marrow-derived cells ameliorated progressive glomerulosclerosis in an experimental rat model, and they were able to produce bone marrow-derived glomerular endothelial and mesangial cells. , These findings suggest that stem cells contribute to renal regeneration in CKD, and the ability to differentiate into multiple renal cell types is a critical step in the process. whether MMCs could repair chronic renal lesions in ADR rats. The primary MMC cultures were prepared as previously described. Briefly, embryonic kidney rudiments were micro-dissected from Sprague Dawley rats on day-13 of gestation. The ureteric buds (UBs) were removed and the remaining mesenchymal cells were propagated in Dulbecco's modified Eagle's medium (DMEM; Gibco, Gaithersburg, MD, USA) containing 10% fetal bovine serum (FBS, Gibco). The cells were cultured at 37°C under a 5% CO 2 atmosphere. The purity of MMCs has been described previously. Osteogenesis and adipogenesis were also performed to determine MMC multipotency. Adipogenic differentiation medium and osteogenic differentiation medium were purchased from Cyagen (Chicago, IL, USA). Three female rats were intravenously treated with ADR (Pharmacia & Upjohn S.P.A., Milan, Italy). Briefly, the rats were injected twice, via the tail vein, with a single dose of ADR (0.25 mg/100 g body weight) in saline, on days one and 21. Eight weeks after the second ADR injection, all rats were sacrificed. Serum was collected from the inferior vena cava, centrifuged (3000 ×g) at 4°C for 10 min, and stored at -80°C. Renal cortices were harvested and homogenized in the same volume of phosphate buffered saline (PBS). The suspension was centrifuged (1500 ×g) for 10 min and the supernatant was filtered with a 0.22 μm membrane (Millipore, Billerica, MA, USA). For treatment with ADR/rat serum, the MMCs were seeded on coverslips in six-well plates (Corning, New York, OH, USA) at 1 × 10 5 cells/ mL. At 80% confluence, the culture medium was changed to differentiation medium (DMEM containing 5% FBS and 5% ADR/rat serum). Cells were collected at different times (on days 3, 6 or 9) for further immunocytochemistry. Before treatment with the ADR-treated cortex homogenate, a methyl thiazolyl tetrazolium (MTT; Amresco, Piscataway, NJ, USA) assay was performed to determine the optimum homogenate concentration. The homogenate supernatant was added to the culture medium at (v/v) 0.1, 0.5, 1.0, 1.5 and 3% in three parallel experiments. Based on the MTT assay, medium containing 0.5% homogenate supernatant was used for later experiments. MMCs cultivated on chamber slides were fixed in Carnoy's fluid (6:3:1 ratio of absolute alcohol:chloroform:acetic acid) for 15 min. The slides were incubated at 4°C overnight with primary antibodies: goat polyclonal antibody to cytokeratin-18 (CK-18, 1:200), mouse monoclonal antibody to pan-cytokeratin (CK, 1:200), mouse monoclonal antibody to vimentin (1:100), rabbit polyclonal antibody to E-cadherin (1:100), and rabbit polyclonal antibody to vitamin D receptor (VDR, 1:200). Following this, the secondary fluorescein isothiocyanate- or biotinlabeled anti-goat, anti-mouse, or anti-rabbit antibodies (1:200) were incubated for one hour at room temperature. Controls included secondary antibodies alone to ensure specificity. All antibodies were purchased from Santa Cruz (Santa Cruz, CA, USA). Images from serial slides were acquired using a SPOT digital camera and ImagePro Plus 6.0 software. Western blotting was performed to detect CK-18 protein in induced MMCs, as previously described. Briefly, 50 μg of total protein was added per lane and the proteins were separated by 12% sodium dodecyl sulfate-polyacrylamide gel electrophoresis (SDS-PAGE) and transferred to a nitrocellulose membrane (Amersham, Piscataway, NJ, USA). The membranes were incubated with the primary antibody for CK-18 (1:500, Santa Cruz) at 4°C overnight, detected using a peroxidase-conjugated second antibody (1:80,000, Santa Cruz) and visualized using an enhanced chemiluminescence (ECL) system (Amersham). Glyceraldehyde-3-phosphate dehydrogenase (GAPDH) (1:8,000; ProMab, Richmond, CA, USA) was used as an internal control. Band intensities were determined by ImagePro Plus 6.0 software. MMCs were labeled with green fluorescence protein (GFP) by Lipofectamine 2000 (Invitrogen, Carlsbad, CA, USA)-mediated gene transfer. GFP- Escherichia More Details coli JM109 recon (Novagen, USA) and Plasmid Maxi Kit (Qiagen, Valencia, CA, USA) were used for plasmid preparation. The transfection efficiency of GFP was examined under fluorescent microscopy. Five fields were observed in each well and a total of 200 cells were observed in each field to calculate the percentage of cells expressing GFP. To determine whether MMCs had acquired a renal cell phenotype after injection into ADR-treated rats, three rats with ADR-induced glomerulopathy (2 months after the second ADR injection) were transplanted with GFP-labeled MMCs. To parallel the in vitro induction, some rats were sacrificed one week after MMC injection. Renal tissues were embedded in optimum cutting temperature compound, snap frozen in liquid nitrogen, and stored at -80°C until use. Epithelial cells derived from MMCs were identified by double staining for GFP and the epithelial specific marker CK. Frozen sections (3 μm thick) were fixed in ice-cold acetone for 10 min, permeabilized and stained with anti-GFP (1:200; Abcam, Cambridge, UK) and anti-CK (1:200; Santa Cruz), with species-specific secondary antibodies were (Invitrogen) conjugated to fluorescein isothiocyanate or propidium iodide. Samples were assessed visually for GFP and CK using a fluorescence microscope (Olympus BX51, Tokyo, Japan). As a negative control, primary antibodies were replaced with PBS. control group (n = 6): the rats were injected twice with 2 mL of saline followed by an injection of 2 mL of PBS at eight weeks after the second administration of saline. Twenty-four-hour urine samples were collected one week before ADR administration and every four weeks after the second ADR administration to measure 24-hour urinary protein (UP) and creatinine (Ucr). During urine collection, the rats were housed for 24-hours in metabolic cages with access to water only. All animals were sacrificed 16 weeks after the second ADR injection by intra-peritoneal injection of 10% chloraldurat (3.5 mL/100 g). Blood was collected after a 24-hour fast by inferior vena caval puncture. Serum was stored at -4°C and used to measure serum albumin (ALB), total cholesterol (TCH), blood urea nitrogen (BUN) and serum creatinine (Scr) levels. Biochemical parameters were measured using an automated biochemistry analyzer (Beckman, Fullerton, CA, USA). The creatinine clearance rate (Ccr) was determined using the conventional clearance formula, Ccr (mL/min) = Ucr (μmol/mL) × V (urine flow rate, mL/min)/Scr (μmol/mL). In vitro studies were repeated at least three times. All results are expressed as means ± standard error of the mean. Statistical significance was determined using Student's t test or oneway analysis of variance. P < 0.05 was considered statistically significant. Osteogenesis [Figure 1]a and adipogenesis [Figure 1]b were carried out to confirm the multipotency of MMCs. Subsequently, we examined protein markers for cell conversion in vitro, including vimentin for the mesenchymal phenotype, CK-18 (an early subtype of CK  ) and pancytokeratin (CK) for the epithelial phenotype, vitamin D receptor (VDR) for the proximal tubule phenotype  and E-cadherin for the distal tubule phenotype. After induction with ADR/rat serum [Figure 2]a and homogenate [Figure 2]e, CK-18 fluorescence was more intense on days six and nine than on day three. 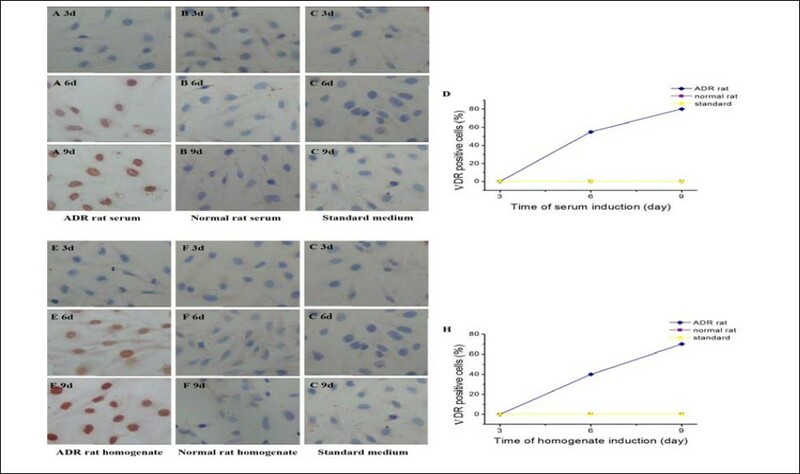 However, exposure to normal rat serum [Figure 2]b or homogenate [Figure 2]f induced CK-18 expression six days later. Figure 1: Osteogenesis and adipogenesis of MMCs in vitro. After incubation for 3 weeks in osteogenic differentiation medium or adipogenic differentiation medium, the cells were round or irregular in shape. Osteogenesis (a) and adipogenesis (b) were visualized with Alizarin Red S and Oil Red-O staining, respectively (400×). Figure 2: Induction of CK-18, an epithelial expression marker, in MMCs in vitro. Representative photomicrographs of immunofluorescent staining of MMCs induced for 3, 6 or 9 days in medium supplemented with ADR/rat serum (a), renal cortex homogenate (e), normal rat serum (b), or renal cortex homogenate (f). Standard culture medium consisting of DMEM with 10% FBS was used as a control (c and g) (400×). Western blotting was performed to detect CK-18 expression and its relative abundance was determined as the densitometric ratio of CK-18/GAPDH (d and h). Values are means ± SE (n = 3). #P < 0.05 versus medium containing normal rat serum or homogenate at the same time. ##P < 0.01 versus medium containing normal rat serum or homogenate at the same time. VDR was not expressed on day three after induction, but was detectable six days after induction by ADR/rat serum ([Figure 3]a, day 6) and by the homogenate ([Figure 3]e, day 6), with greater intensity on day nine, especially with the homogenate ([Figure 3]e, day 9). However, VDR staining was not detected after induction by serum [Figure 3]b) or homogenate [Figure 3]f from normal rats. The treatments did not affect vimentin, CK, or E-cadherin signals (data not shown). These data suggest that treatment with serum or homogenates from ADR-treated rats causes differentiation of MMCs in vitro to form renal tubular epithelial-like cells, specifically proximal tubule-like cells. Figure 3: Induction of VDR in MMCs in vitro. Representative photomicrographs of immunohistochemistry staining for MMCs induced for 3, 6 or 9 days in medium supplemented with ADR/rat serum (a), renal cortex homogenate (e), normal rat serum (b), or renal cortex homogenate (f). Standard culture medium consisting of DMEM with 10% FBS was used as a control (c). Quantitative analysis of VDR expression (d and h). Values are means ± SE (n = 3), P < 0.01 (400×). Because the regeneration process resembles development  and many types of renal epithelia (except the collecting duct) are derived from MMCs, , differentiation of MMCs into renal lineage cells would facilitate differentiation into epithelia. Moreover, Fajardo et al reported that nature of epithelial cell recovery for renal regeneration in this model. Therefore, to determine whether MMCs can form renal epithelial cells after transplantation in ADR-induced glomerulopathy, we performed double-labeling with GFP and CK antibodies. 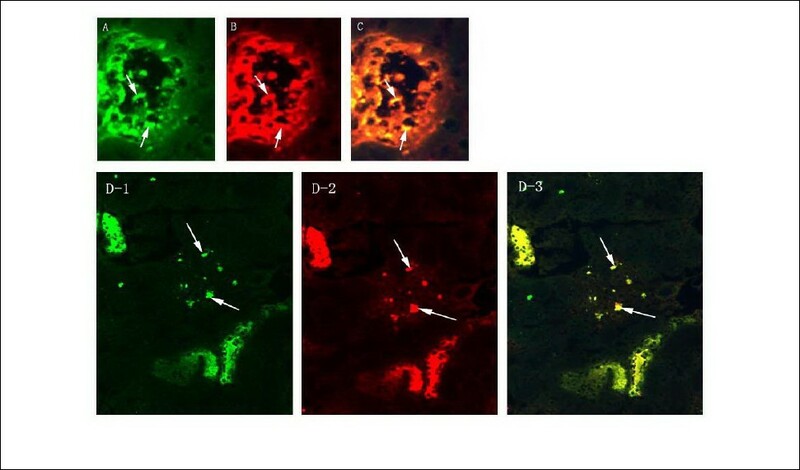 The MMCs co-expressed GFP ([Figure 4]a, green), a marker for injected cells, and CK ([Figure 4]b, red), an epithelial marker, in the renal tubules ([Figure 4]c, yellow), after injection into ADR rats. Of note, most of the double-labeled cells were located in the proximal tubule in the inner cortex and outer medulla. A few double-labeled cells were also detected in the glomeruli ([Figure 4]d). These findings indicate that MMCs are distributed and can survive and participate in renal epithelial formation, particularly in the proximal tubule epithelia. Because only 30% of the transplanted MMCs were GFP-positive cells, we did not analyze the percentage of GFP-positive cells distributed across the entire kidney. 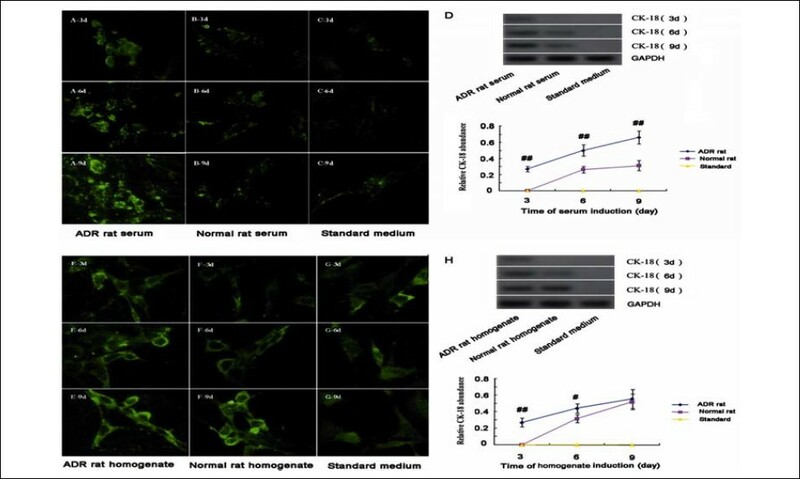 Figure 4: Representative photomicrographs of double-staining for GFP and CK. GFP (a; green) and CK (b; red) are both located in the cytoplasm (400×). Cells co-expressing GFP and CK (c; yellow) (400×), indicating MMC-derived epithelial cells, are mainly located in the proximal tubules of the inner cortex and outer medulla, but a few are present in the glomeruli (d) (200×). The white arrowheads indicate fluorescently labeled MMC-derived epithelial cells. The levels of UP, ALB and TCH in the ADR-MMC group were not significantly different from the ADR group, but Ccr was significantly increased in the ADR-MMC group versus the ADR group (P < 0.05). 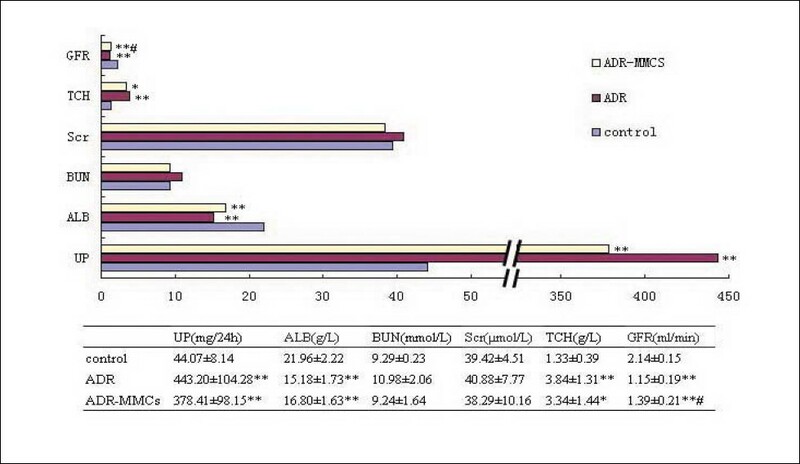 In addition, there were no significant differences in BUN or Scr levels between rats with and without ADR administration, as shown in [Figure 5]. Figure 5: Effects of MMC transplantation on biochemical markers in rats with ADR-induced glomerulopathy. ADR-treated rats, with and without MMC treatment, showed significantly higher levels of UP, TCH and decreased levels of ALB and Ccr compared with the control rats. There were no significant differences between ADR-treated rats with and without MMC treatment, except for Ccr. In addition, there were no significant differences in BUN or Scr between rats treated with and without ADR. *P < 0.05 versus control rats, **P < 0.01 versus control rats, #P < 0.05 versus ADR rats. It has been suggested that the regeneration process resembles development. Whether the stem cells are committed to differentiation depends in part on the secreted growth and differentiation factors that mimic the environment of a particular cell lineage. Therefore, MMCs can be differentiated using medium supplemented with ADR/rat serum or renal homogenate. The early changes in CK-18 expression indicate that the cultured cells might have started epithelialization, and the expression of VDR revealed that MMCs can differentiate into proximal tubule epithelial-like cells when exposed to media supplemented with ADR/rat serum or homogenate. The concentration of serum in the culture medium is 20-fold greater than in the homogenate, which suggests that the stimulation factors were more concentrated than in the homogenates. MMCs can differentiate into many types of renal epithelia in vivo, including distal tubules. Here, if MMCs differentiated according to embryonic metanephric development, expression of CK and E-cadherin should be enhanced and vimentin should be decreased, with positive expression of CK-18 and VDR. However, we could not detect changes in all these markers after cell induction, perhaps because of their low expression levels or poor antibody sensitivity. We previously found that MMCs can derive into epithelial cells in the glomerulus, indicating that MMCs can differentiate into epithelial cells or fuse with resident cells in the glomeruli. However, this did not decrease proteinuria. It was recently reported that podocyte damage is an important cause of protein leakage,  and podocytes have limited capacity to proliferate  in ADR-induced chronic glomerulopathy, which suggested initial damage to epithelial cells (including podocytes). Therefore, to reduce or prevent ADR-induced chronic glomerulopathy, therapy should be applied earlier to protect the podocytes. Further studies are needed in this process. Renal function can be estimated by the glomerular filtration rate, which reflects the number of functioning nephrons. The glomerular filtration rate is a more sensitive indicator of glomerular disease rather than tubular disease, and is usually measured as Ccr. Creatinine is mainly filtered through the glomeruli and is partially excreted from the renal tubules. As renal function declines, the excretion of creatinine from the renal tubules increases. Therefore, abnormal Ccr may be a marker of changes in glomeruli, renal tubules, or both. In our study, Ccr was significantly increased in the ADR-treated rats after MMC treatment, and MMC-derived epithelial cells were detected in the renal tubules and glomeruli, suggesting that engraftment and differentiation of MMCs may potentiate functional repair in this model. However, there were no significant differences in UP, ALB and TCH levels, although there was a trend toward positive changes in these measurements. In addition, there were no significant differences in BUN or Scr levels between rats with and without ADR administration, which suggests that a longer observation time should be considered in future studies. In vitro , we found that the MMCs differentiated into tubular epithelial-like cells, expressing an epithelial phenotype or a proximal tubule phenotype, as demonstrated by the protein expression profiles, including CK-18 for the epithelial phenotype, and vitamin D receptor for the proximal tubule phenotype. Therefore, it is clear that these MMCs have the capacity to differentiate into functionally relevant cell types in vitro. In vivo , the injected MMCs retained their differentiation potential, as demonstrated by the presence of cells expressing GFP and CK in the renal epithelium, and were primarily localized to the inner cortex and outer medulla. Unfortunately, despite the localization of the MMCs, this was not associated with marked improvements in biochemical parameters. In our study, it is possible that the experimental methodology used limited the improvements observed. First, the cells were injected through the tail vein. Accordingly, it is possible that many cells did not reach the intended destination. Administration of a greater number of cells or direct injection of the cells into the renal artery may facilitate deposition of the cells directly into the kidney. A further parameter that should be investigated is whether there is an optimum time window for treatment and follow-up. It is conceivable that the tubular injury results in the formation of large pores, which require extensive repair and cell replacement. The paracrine activity is thought to be a major reason for the influence of stem cells in organ regeneration, particularly in terms of intrinsic cell differentiation, although this is still controversial. Nevertheless, the ability of stem cells (endogenous or exogenous) to differentiate into multiple renal cell types in the process should not be overlooked. ,, Thus, earlier administration of stem cells is recommended and the administration of MMCs could have been performed earlier after the second dose of ADR in this study. Furthermore, by increasing the follow-up time to 20 weeks or longer, or assess cellular proliferation and apoptosis, it is likely that we would have observed greater effects in this tissue. These factors need to be investigated in more detail to better understand whether the transplantation of MMCs is beneficial in terms of improving the function of the renal epithelium. In summary, we have demonstrated that MMCs can differentiate in vitro into renal epithelial like cells if induced by serum or homogenates from ADR rats. MMCs could also survive, engraft and differentiate into renal epithelial cells in vivo when transplanted to ADR-treated rats. However, whether long-term MMC treatment can prevent a further decline in renal pathology and function in this model still needs to be determined. This work was granted by the National Natural Science Foundation of China (No. 30672251) and Key Disciplines Construction Fund of Hunan. 1. Meguid El Nahas A, Bello AK. Chronic kidney disease: the global challenge. Lancet 2005;365 (9456):331-40. 2. Levey AS, Atkins R, Coresh J, et al. Chronic kidney disease as a global public health problem: approaches and initiatives - a position statement from Kidney Disease Improving Global Outcomes. Kidney Int 2007;72(3):247-59. 3. Sagrinati C, Ronconi E, Lazzeri E, Lasagni L, Romagnani P. Stem-cell approaches for kidney repair: choosing the right cells. Trends Mol Med 2008;14(7):277-85. 4. Little MH. Regrow or repair: potential regenerative therapies for the kidney. J Am Soc Nephrol 2006;17(9):2390-401. 5. Prodromidi EI, Poulsom R, Jeffery R, et al. Bone marrow-derived cells contribute to podocyte regeneration and amelioration of renal disease in a mouse model of Alport syndrome. Stem Cells 2006;24(11):2448-55. 6. Li B, Morioka T, Uchiyama M, Oite T. Bone marrow cell infusion ameliorates progressive glomerulosclerosis in an experimental rat model. Kidney Int 2006;69(2):323-30. 7. Ikarashi K, Li B, Suwa M, et al. Bone marrow cells contribute to regeneration of damaged glomerular endothelial cells. Kidney Int 2005; 67(5):1925-33. 8. Horster MF, Braun GS, Huber SM. Embryonic renal epithelia: induction, nephrogenesis, and cell differentiation. Physiol Rev 1999;79(4):1157-91. 9. Oliver JA, Barasch J, Yang J, Herzlinger D, Al-Awqati Q. Metanephric mesenchyme contains embryonic renal stem cells. Am J Physiol Renal Physiol 2002;283(4):F799-809. 10. Qiao J, Cohen D, Herzlinger D. The meta-nephric blastema differentiates into collecting system and nephron epithelia in vitro. Development 1995;121(10):3207-14. 11. Lazzeri E, Crescioli C, Ronconi E, et al. Regenerative potential of embryonic renal multi-potent progenitors in acute renal failure. J Am Soc Nephrol 2007;18(12):3128-38. 12. Dekel B, Reisner Y. Embryonic committed stem cells as a solution to kidney donor shortage. Expert Opin Biol Ther 2004;4(4):443-54. 13. Bertani T, Rocchi G, Sacchi G, Mecca G, Remuzzi G. Adriamycin-induced glomerulosclerosis in the rat. Am J Kidney Dis 1986;7(1):12-9. 14. Bertani T, Cutillo F, Zoja C, Broggini M, Remuzzi G. Tubulo-interstitial lesions mediate renal damage in adriamycin glomerulopathy. Kidney Int 1986;30(4):488-96. 15. Shu Y, Hoshi S, Tomari S, Watanabe T, Nagata M. Phenotypic changes and cell cycle activation in early tubulointerstitial injury of rat adriamycin nephrosis. Pathol Int 2002;52(3):214-23. 16. Sgodda M, Aurich H, Kleist S, et al. Hepatocyte differentiation of mesenchymal stem cells from rat peritoneal adipose tissue in vitro and in vivo. Exp Cell Res 2007;313(13):2875-86. 17. Guo J, Tao SX, Chen M, et al. Heat treatment induces liver receptor homolog-1 expression in monkey and rat sertoli cells. Endocrinology 2007;148(3):1255-65. 18. Ostalska-Nowicka D, Zachwieja J, Nowicki M, Witt M. Expression of intermediate filaments of podocytes within nephrotic syndrome glomerulopathies in children. Histochem Cell Biol 2004;121(2):109-13. 19. Maiti A, Beckman MJ. Extracellular calcium is a direct effecter of VDR levels in proximal tubule epithelial cells that counter-balances effects of PTH on renal Vitamin D metabolism. J Steroid Biochem Mol Biol 2007;103(3-5):504-8. 20. Cho EA, Patterson LT, Brookhiser WT, Mah S, Kintner C, Dressler GR. Differential expression and function of cadherin-6 during renal epithetlium development. Development 1998;125(5):803-12. 21. Shah MM, Sampogna RV, Sakurai H, Bush KT, Nigam SK. Branching morphogenesis and kidney disease. Development 2004;131(7):1449-62. 22. Fajardo LF, Eltringham JR, Stewart JR, Klauber MR. Adriamycin nephrotoxicity. Lab Invest 1980;43(3):242-53. 23. Mori K, Yang J, Barasch J. Ureteric bud controls multiple steps in the conversion of mesenchyme to epithelia. Semin Cell Dev Biol 2003;14(4):209-16. 24. Barasch J, Yang J, Ware CB, et al. Mesenchymal to epithelial conversion in rat meta-nephros is induced by LIF. Cell 1999;99(4):377-86. 25. Vukicevic S, Kopp JB, Luyten FP, Sampath TK. Induction of nephrogenic mesenchyme by osteogenic protein 1 (bone morphogenetic protein 7). Proc Natl Acad Sci U S A 1996;93(17): 9021-6. 26. Yang J, Goetz D, Li JY, et al. An iron delivery pathway mediated by a lipocalin. Mol Cell 2002;10(5):1045-56. 27. Plisov SY, Yoshino K, Dove LF, Higinbotham KG, Rubin JS, Perantoni AO. TGF beta 2, LIF and FGF2 cooperate to induce nephrogenesis. Development 2001;128(7):1045-57. 28. Kim D, Dressler GR. Nephrogenic factors promote differentiation of mouse embryonic stem cells into renal epithelia. J Am Soc Nephrol 2005;16(12):3527-34. 29. Helmuth L. Neuroscience. Stem cells hear call of injured tissue. Science 2000;290(5496):1479-81. 30. Maeshima A. Label-retaining cells in the kidney: origin of regenerating cells after renal ischemia. Clin Exp Nephrol 2007;11(4):269-74. 31. Asanuma K, Yanagida-Asanuma E, Takagi M, Kodama F, Tomino Y. The role of podocytes in proteinuria. Nephrology (Carlton) 2007;12 Suppl 3:S15-20. 32. Shankland SJ, Eitner F, Hudkins KL, Goodpaster T, D'Agati V, Alpers CE. Differential expression of cyclin-dependent kinase inhibitors in human glomerular disease: role in podocyte proliferation and maturation. Kidney Int 2000; 58(2):674-83. 33. Price CP, Finney H. Developments in the assessment of glomerular filtration rate. Clin Chim Acta 2000;297(1-2):55-66. Zickri, M.B. and Zaghloul, S. and Farouk, M. and Fattah, M.M.A. Zickri, M.B. and Fattah, M.M.A. and Metwally, H.G.